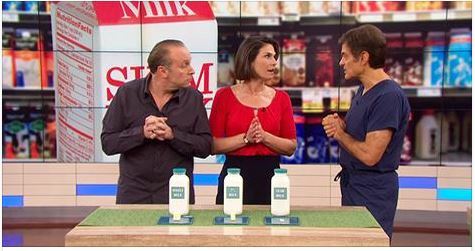 Monica on Dr. Oz: What’s the deal with designer milk? Should you drink whole milk or skim? Enhanced skim? What about the new “designer” milk from Coca-cola? I recently sorted it all out for Dr. Oz. Watch the clip here. Lisa Oz and Monica show you some synergistic–and delicious–food combinations that also help you maximize nutrient absorption. Plus, how to make sure you’re getting enough (but not too much) from your supplements. Could you use more energy? (Who couldn’t?) You may be suffering from one (or more) of these four common nutrient deficiencies. In this clip, Dr. Oz and I reveal the nutrient deficiencies that may be sapping your energy, plus the energy-boosting foods that can correct the deficiencies. Most of them are hiding in your pantry right now!